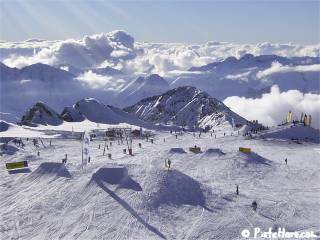 The ski resort of Les Deux Alpes is situated in the Oisans area of the Isère department in the Northern Alps. Along with its neighbour l'Alpe d'Huez it forms the two largest resorts in the Oisans and Isère areas. The lift served area extends from 1300 metres to 3568 metres giving over 2,250 meters of vertical under ideal conditions. There are 220 km of lift served runs covering 420 hectares. The 80 hectares of runs on the Mont de Lans glacier offer guaranteed of skiing, there are a number of easy and intermediate runs at this level. Around 60% of the marked ski runs are suitable for beginners and intermediates with 40% aimed at advanced skiers. There are 13 black, 17 red, 45 blue and 27 green runs. 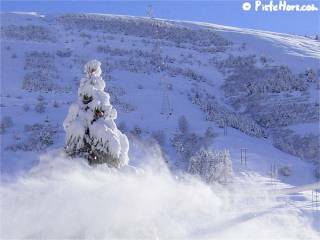 The area also offers over 1000 hectares of off piste skiing. There is a cat skiing link to la Grave and les Vallons de la Meije backcountry domain. This is included in any pass of 6 days or more and a days skiing can be obtained for a small supplement on shorter les Deux Alpes lift passes. It is also possible to ski in lAlpe dHuez via a direct shuttle link or helicopter transfer. The slopes are served by 51 mechanical ski lifts including 23 chair lifts, 19 drag (poma) lifts, 3 gondola lifts, 3 cable cars and an underground funicular railway. The ski lifts carry around 17 million passengers per year with about 1.3 million skier days. The lifts have an total capacity of 71,767 passengers. The DAL employs 120 staff on permanent contracts and up to 380 seasonal employees. There are 20 km of cross country trails. 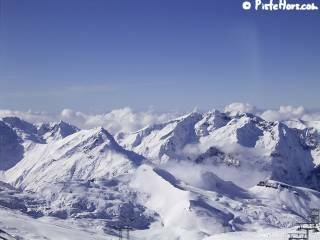 Les Deux Alpes is open for 9 months of the year. During the winter and spring, for summer glacier skiing at at autumn half term for the Ski and Snowboard Mondials. Les Deux Alpes is an international resort. During the 2005/6 winter 54% of visitors came from outside of France. Foreign visitors include 34% from the United Kingdom, an increase of 11% on the previous year. Other major countries are Holland, Italy and Belgium. The tourist office says that in general the Brits come for the skiing, the Germans for the excellent sports facilities and the Belgiums head for the off-piste. An increasing contingent of Spanish visitors are attracted by the boarder cross and snowpark. 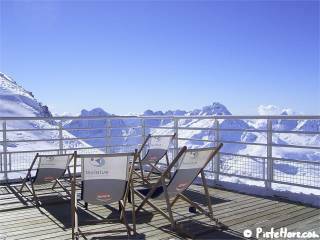 From the top of the top of the slopes at over 3,000 meters the view over the French and Italian alps is stunning. From Mont Ventoux in the south to Mont-Blanc and beyond in the north. The resort features "ski to door" for most accomodation thanks to special tracks and artificial snow making. There are over 200 snow canons covering 20 pistes and a total of 47 hectares of slopes. 60% of th ski runs receive daily grooming by from a team of 50, including 38 avalanche control experts, using state of the art Kassbohrer and Prinoth piste bashers. There was a total of 17,000 hours of snow grooming in the 2006 season. The team also erect protective netting, padding and sign posting areas at risk. 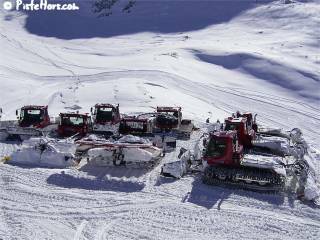 There are 28 gazex and catex avalanche control systems as well as 1 avalancheur. Les Deux Alpes is following the trend to themed slopes the Slide zone, freeride Fun zone and Snowpark have won international acclaim. Les Deux Alpes is a paradise for the new boardsports. The resort has a snowpark, boardsports areas and a freecross area (boardercross and skiercross). The winter snowpark, situated in the La Toura sector operates in winter and in summer the snowpark moves to the glacier, where it welcomes the greatest riders on the planet. Numerous French and international events are hosted here. The snowpark covers 10 hectares of slopes. There is beginners' area aimed specifically at inexperienced freestylers. 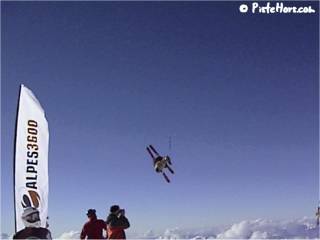 It provides a succession of small kickers (6 moguls) which enable the most intrepid to try their first jumps. The winter half-pipe is 120 meters long and meters high. Half-pipe is an Olympic discipline. There are two half-pipes in summer. A slope style zone provides a succession of technical modules such as hips, gaps or quarters before reaching the handrail zones over a course that is nearly 400 meters long. There is also an area 100% devoted to and equipped for snow skates (equipment can be borrowed on site in exchange for an item of identification). A chill-out zone with BBQ, music, open DJ turntable and deck chairs to recover. Visitors wishing to experience new sensations or freestyle can enjoy the "SLIDE" zone, a universe of newschool boardsports, which opened in 2003. There is a second Boardercross at 2600 m is designed for beginners. It is a simple concept, a 14 by 28 meter landing mattress lets inexperienced or experienced freestylers train for the jumps of their dreams in complete safety. Knowing there is a safe landing means less apprehension, minimum risk, and optimum safety. The resort is famous for its downhill mountain biking circuit. This is one aspect of the resort we like less as the slopes are cut up by mountain bike tracks and assorted paraphernalia. From 2006 the bike park will be open all winter from 18h30 to 20h30 on Thursdays. Snowbike sessions offers mountain bikers the chance to use the ski runs starting at 3200 meters from 7h30, This is before skiers are allowed on the slopes. There are six sessions scheduled for 2007: 17 February, 24 February, 3 March, 10 March, 7 April and 14 April 2007  the price is  25, which includes the descent and breakfast. The resort estimates that 30% of visitors neither ski or snowboard. The guides office offers snow shoe tours on the glacier including a visit to crevasses at 3200 meters. The many frozen waterfalls are also a mecca for ice climbing enthusiasts. The two original villages of Venosc and Mont-de-Lans are well worth visiting. Venosc is linked by a gondola lift. Les Deux Alpes offers excellent sports amenities including a heated outdoor swimming pool, an indoor swimming pool, an artificial outdoor skating rink as well as fitness and relaxation centres, squash courts, spas, Turkish baths, saunas, relaxation tanks, health runs, slimming courses, massages, relaxation, gym, muscular training, fitness, cardio-training, aquagym, solarium, UVA. There is barely time left for skiing! The many luxury apartment blocks and traditional hotels complement these facilities with fitness training, aquagym, shiatsu, complete massage programmes (body shaping, Zen, beauty, healthy back, happy mum or getting ready to go skiing). A majority stake in Deux Alpes Loisirs which owns the resort's ski lifts was put up for sale at the end of 2008 and has apparently been bought by the Compagnie-Des-Alpes which already has a controlling interest in nearby Serre Chevalier?. The new operator has a concession for 13 years and will have to deal with aging infrastructure such as the Diable gondola lift which is 35 years old. Apart from the lifts, Deux Alpes Loisirs owns a travel agency, the swimming pool and ice rink plus 1400 beds worth of apartments as well as the mountain restaurants of les Glaciers and the Chalet de la Toura. The DAL employes 400 season and permanent staff with a turnover in 2008 of nearly 35 million euros. In 1997, the DAL acquired apartments with a view to their rehabilitation and, in 2003, it bought out a number of hotels in order to turn them into high class residences. In 2005, the residence, Le Cortina, saw the light of day. A high class residence situated close to the Place de Venosc, in a lively part of the resort, a residence with top of the range amenities, luxurious and spacious apartments, an authentic character and only a short walk from the ski lifts. In 2007, the new Alba residence of will open followed by further apartment blocks in 2008. Today's apartments are larger and better appointed. The average renovation has cost  3000 per m². The road link has been much improved over the last decade and the slopes can be reached within an hour 's drive from Grenoble. There is a regular bus service from Grenoble train station and also a direct bus link running twice weekly from l'Alpe d'Huez. The resort has 128 stores including sports shops, 15 prêt-a-porter boutiques, 8 food shops and 6 shops selling regional products. There are also 13 estate agencies. You can buy the latest ski and snowboard gear, clothing, souvenirs and traditional regional food and drink. Go easy on the Genepy. A 200m² shop dedicated to snowsports. We have a wide range of equipment available for all ages and abilities, from beginners through to competition standard. We also have a wide range of equipment for off-piste and freestyle. All our equipment is in excellent condition as the shop only opened in December 2008. For your comfort and safety we have expert ski technicians who will fit your boots and set up your bindings. We can also offer a delivery service to your hotel after your equipment has been fitted. Adult skis and boots from just 36.85 per week. A range of activities are offered including preparation for the ski instructor certificate, all mountain skiing, slalom, giant slalom training, timed test, Damien Albert courses (freeride, off piste, mogul skiing). Evolution 2 is a ski and snowboard school offering all levels of instruction. Our multi-lingual (English, French and Italian speaking) professionals are able to offer ski or snowboard lessons for children, teens and adults in either groups of no more than 4 people or groups of up to 8 people. We also offer off-piste guiding, freestyle and race technique lessons. For children there are free medals, free use of helmets, free certificates and a private bus for collection before lessons. Our aim is to offer a personal approach to learning so that you feel a great sense of achievement and progression while having fun.